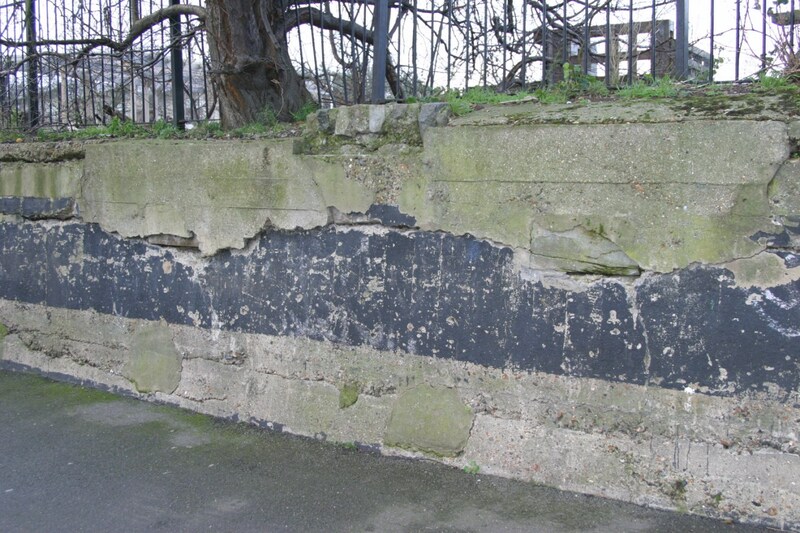 Southwark Council has decided that the original retaining wall of Glengall Wharf should be replaced with a concrete block barrier similar to those used on motorway embankments. Flowers and plants in the gaps will look ‘nice’, but effectively erase any idea of a canal bank. The existing wall is certainly not pretty, but it’s a major piece of industrial archaeology from the days when the canal ran alongside and turned down towards Peckham. Apart from the small low concrete ledge in the grass oppposite, it’s the only piece of original canal bank left on the entire three and a half mile length of the Grand Surrey Canal. It features in numerous historic photos of the area. In this image, you can see the black painted wall with timber fenders attached part way down. In the present-day image above and below, the black painting is still visible, with plain concrete below, where the fenders had been attached. It’s also still possible to see large stone blocks embedded in the wall, if you take a walk today. These were the footings of the large loading chutes visible in the historic image. There are 12 visible on the Peckham route, corresponding to the 6 loading chutes which were on that side of Glengall Wharf. It seems a great shame to bury almost the last signs of industrial canal heritage for the sake of a tidy-up. 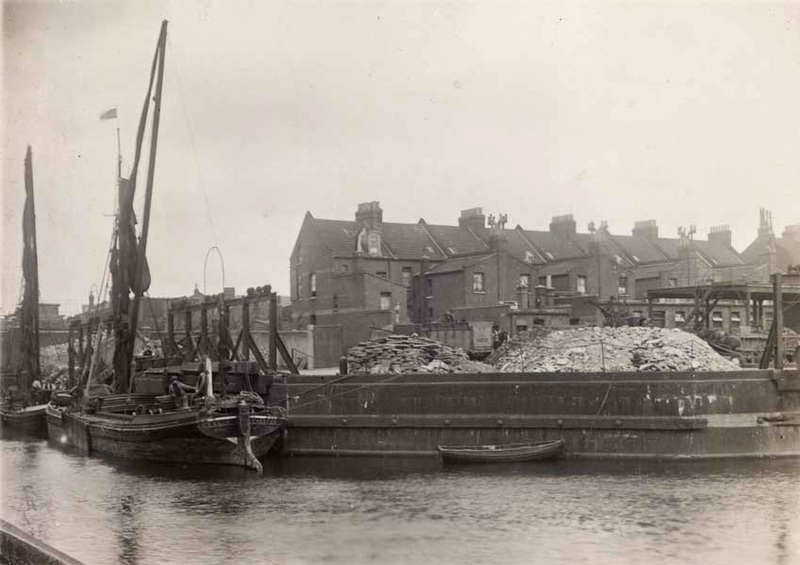 See more on the history of the wharf here. Terrible shame. Better to use the underspend to repair the existing wall. Part of our archaeological heritage and still gives a visual impression of the canal – gives the park atmosphere and character. Just seen this information – seems a real shame given its historic links with the past – are FOBP doing anything to try to get this stopped? I’ve emailed the local Inland Waterways group as I know they are always interested in canal history – whether in water or not. 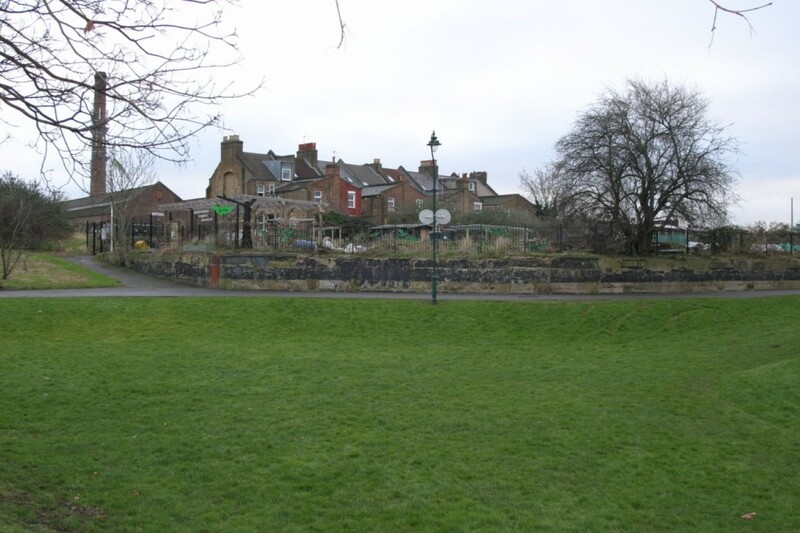 We would have ideally liked to get the demolition stopped and the existing structure repaired, but Council officers have deemed it unrepairable. A second opinion ageed that replacement would be the best option, so it’s days are numbered now. Replacement is due to start in autumn 2015.